SadoTech's wireless doorbells, are integrated with custom proprietary 32 tones, adopts advanced wireless transceiver technology and high-quality voice processing technology. Suitable for villas, clubs, recreation centers, hotels, homes, garages, office building, meeting room etc. Respond to visitors and deliveries, ASAP. With weatherproof receiver buttons, the door bell can be conveniently placed inside or out. The classic white design makes the wireless doorbell able to fit anywhere without disrupting an area's design, even on modern spaces. The Mute door alarm chime volume option gives you the freedom of choice of not responding to visitors without having to unplug the front door alarm. This works well especially during nap breaks. The LED indicators are also suitable for the hearing impaired. Matches your different needs. 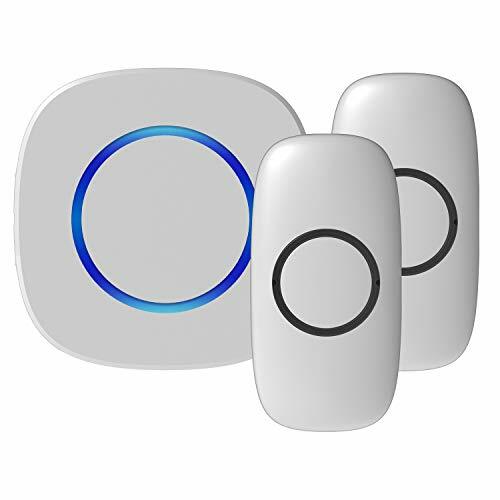 Whether you wish to use it for home convenience or for patient-care, the SadoTech's ring wireless doorbell is a reliable tool to stay alerted on what really matters to you.